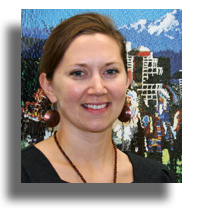 Energetic, vibrant, dedicate, and inspiring, Nichole Maher is executive director of the Native American Youth and Family Center. Under her leadership, NAYA works to enrich the lives of our Native youth and families through education, community involvement, and culturally specific programming. For more than 30 years, NAYA has provided educational services, cultural arts programming, and direct support to reduce poverty to the Portland metropolitan area’s American Indian and Alaska Native community. In a Q&A with Colors of Influence, Nichole talks about the challenges and successes of the local urban Indian community. What is your most important charge as executive director for NAYA? My role is to be the steward of the resources granted or given to serve the community: to make NAYA a thriving, strong and quality organization so we can best utilize our resources to serve the community. The Portland Native community is the ninth largest community of American Indians in the country. There are 55,000 Native people who live in four-county area, 38,000 who live in Multnomah County. NAYA is governed by a board, and the community owns NAYA. We’ve been given an important responsibility by the community, and it is my duty to ensure that only the best quality programs are being provided to the community. On a day-to-day level, a lot of my work also involves empowering my staff to be leaders, to think critically about how best to serve our community, and to really find unique solutions with very little resources. I do a lot of advocacy and education about the community to try to bring awareness to the issues our community faces. Among the greatest challenges faced by our community are false perceptions and stereotypes. What were some of the early challenges when you first took on the role? Invisibility of the community continues to one of our greatest challenges. There was and still is a lot of racism toward Native Americans. Racism is a reality we face every single day. In our community alone, we represent over 380 different tribes, we all look different. Most of us are multicultural and speak different languages. None of us look like the Indians on television. Racism manifests itself in funding decisions. There are countless excuses and reasons why Native Americans don’t deserve to be served. Most of these excuses are made in the name of false perceptions, or discomfort with our community values and traditions. There are many assumptions about our community. That we’re lazy, and that we’re all alcoholics. That we get money from the government and we don’t serve it. That we all get casino resources and I often hear comments that Native Americans are looking for a handout. Then, there’s the deeper, more difficult-to-identify racism – when people pretend that we simply don’t exist anymore. People often use data against us, and minimize our numbers. In many cases, Native Americans have the greatest demonstrated need, and are the most over-represented in poverty etc. Even when administrators of governmental officials state that they want to make data driven decisions, it is still very common that our population is overlooked. These challenges still exist, but we’re doing a better job of creating awareness about our communities, and why it’s important for us to be served. We have 38,000 taxpaying citizens in Multnomah County alone. Our population is growing and we will continue to live and need services in this community. As a nonprofit, we employ 70 employees and pay for health care, retirement, dental and other benefits. Over half of the resources we bring to this community come from foundations outside the Portland area. We bring and spend a lot of money in this community. I think that the contributions we make to this community are often overlooked. When we started advocating, asking for equity, there was a lot of resistance. The questions we asked were simple: if our children represent 15% of kids in foster care, do we get 15% of resources? We’ve worked very hard to build coalitions with other communities. We were a founding member of the Communities of Color Coalition, a coalition of educational providers that is focused on empowering young leaders of color. Other communities have had a longer, more successful history of advocating for themselves and we want to learn from their experience as well as work with them to increase the collective resources for all people of color. How does NAYA create programs that effectively serve urban Indians? Our community helps to design and create programs. We’ve been so accustomed to fighting over the crumbs, taking whatever we can get and shortchanging ourselves. We’ve brought in people who have been great at demanding excellence, because our community deserves the best. We provide services in a place where people feel comfortable. We recognize and embrace that culture is important. Too often services are designed around how to help people become mainstream or how to assimilate. We’re not interested in that. We’ve had 300 years of being forced to assimilate and it has not been successful. The more we teach kids about who they are, why their culture is important and why they should proud of who they are, the stronger they are in every area of their life. We’re not interested in being changed. We want to practice our culture. We want to be together, and have a thriving Native American culture. We fought hard to hold on to our culture, and we’re going to celebrate it and keep it. Especially for our young people, we want them to be proud of their native culture and identity. For a long time, most of our kids who are multicultural and multiethnic have been forced to choose: be native or be something else. We’re adamant that we’re not going to ask our kids to choose. Be everything that they are, and be proud of it. What trends do you see in providing services to the Native community? Our community by and large will not go and get services from what they perceive as majority culture providers. They will not receive services from anything they view as governmental. We have high poverty rates, high incarceration rates, the largest over-representation of kids in foster care, and the highest dropout rate of any population, yet, people in our community are not accessing services. There’s still a lot of fear and mistrust among our community. Our religion was illegal until 1978 when the Native American Freedom of Religion Act was passed. As an assimilation policy, Native children were taken from their families and placed in foster care. The perspective of our elders and older adults is “If you go near the government, there is a high likelihood that your children will be taken away from you”. 1978 is not very long ago. That is part of most of our adult population’s reality and memory. They have a very real memory of the consequences and negative things done to our community. The other reality is that to get services, you have to have a certain level of aggressiveness and assertiveness. If you want housing services, you have to be the first to line up and fill the forms out correctly. Culturally, our community is not assertive, and we’re not going to push our way to the front of the line. A lot of service delivery systems are designed in a way that does not match our world view and values, and are set up so that our access is severely limited. What was your path to leadership? I went to undergrad at OSU, started as a student leader and ended up working for the university in the Native American Longhouse and the Office of Indian education. I worked on several partnerships with several tribes in administering youth programs for our community. After moving to Portland to go to graduate school, I started working as the education coordinator at NAYA. I had been on the job for six months when our executive director – a wonderful friend and mentor – accepted a job offer in Washington, D.C. When NAYA started recruiting for a new executive director, I felt that I was not ready. One of the board members and several community members asked me to apply. The thought was that it would be a good opportunity to get to know the board so that in 10 years, when I have more experience, I can apply for the executive director job. I ended up getting the position. At that time, we had about a $215,000 budget, and this year, we’ll invest over $5 million in services to the community. When I started, we had five staff members and provided tons of services without receiving funding – we just did the best we could. When I took the position, it was my goal to advocate for equitable resources to our community. We also wanted to make sure that we were evaluating our programs, to ensure that they demonstrated impact and that we were measuring our successes. Our Native community is huge, but because our community is so marginalized, we often get completely overlooked. We’ve been successful at employing a two-pronged strategy of making sure we have excellent services, then going out there and advocating for social justice. I also went and asked everybody for help. A lot of people were great and helped me in so many ways. 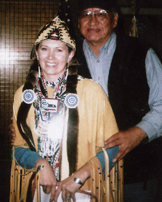 There are so many Native organizations locally and nationally that have really been great supporters of NAYA. We have some core leaders among our staff and they have been wonderfully supportive. A lot of people have said: “Gosh, many of your staff are a lot older than you … and they listen to you?” It’s true: many of our staff members have a much greater knowledge base about their areas of expertise. My leadership style is to find excellent staff and give the resources and support to enable them to do what they do best. We’re a fast-growing population. Our average number of children per family is 5. 40% of our population is under age 25. We’re going to continue to grow. Particularly in this community, housing is a major issue. Our population is being pushed out of Portland because we can’t afford housing. We’ve recently purchased 44 units of low-income housing, and we’ll continue to grow our portfolio of low-income housing in St. John’s and the greater Portland area. How does the organization determine what programs to provide the community? It’s tricky because we have so many needs. We could be growing leaps and bounds, but we have tried to be thoughtful about starting and maintaining quality programs. Our mission statement guides everything we do and keep us on task about our scope of work. Our board goes through a strategic planning process, and we do a lot of work asking the community to guide us. Last year, we did focus groups with every demographic in our community: community partners, elders, youth, kids in foster care, middle schooler’s, parents, grandparents. We took them through the process of defining success on our own terms – and not necessarily what the funders think success should be. We used that to guide our strategic planning process. We try to be really responsive in listening to the community. It’s very difficult though because the community wants us to provide ten times as many programs and activities as we can afford. It’s always a dialogue and we maintain a respectful relationship with our community. There are many things we’d like to do but we do not always have the capacity to get the program started. We have to be thoughtful and manage our own growth. We don’t want programs for the sake of programs: we want excellent programs with really good outcomes. Sometimes we say “No, thank you” to partnerships because they’re not quite the right fit. It’s really important to have boundaries and a strong sense of our mission and what we can do well. I am very proud of the fact that we have a staff that is 85% Native American; 95% have at least a four-year degree; and 35% have a master’s degree or beyond. I’m very proud of the incredibly highly qualified professionals we’ve been able to attract to the agency – native and non-native – who give so many gifts. We’re very proud of the way we engage and involve the community in everything we do. We’re very proud of our reputation for providing excellent services and delivering outcomes. When kids come to our tutoring center, their benchmark achievements significantly increase. Students who participate in our programs are five times more likely to graduate from high school than other Native children. Folks who participate in our employment program have seen their incomes increase by 25 percent this past year. Through our programs, we’ve established track record of success really providing quality services, having the focus on outcomes and benefits to students and families. We’re very proud of starting our own school. Our community has wanted a school of our own for 32 years, and this is our school’s first year. Since I came to NAYA, we’ve been working on building capacity and infrastructure- then worked on planning and developing the school. By the end of this year, we’ll have 100 students attending the Native American Early College Academy. Students take their 9 th and 10 th grade year; 11th and 1 th grade years, get college and high school credits for their coursework. The partnership with Portland Public Schools and four other school districts is academically rigorous. Students apply and go through a pretty strenuous application process. We’re very proud of the collective work of our board and community elders. Their participation brings light to the fact that we are a very large and important community in Portland. I’m a firm believer in social justice, not only for the Native community, but for all communities of color and the gay and lesbian community. We all need to united and work together on the common issues we face. I love to bring attention to the Native community and bring attention to needs and disparities that exist. But even better than that is working with other community leaders to work collectively toward solutions that benefit us all. The Healing Circle works to keep Native families safe and to educate Native people in an effort to end the silence around domestic and sexual violence. Native Community Employment Services assist Native American and Alaska Native individuals to ensure their success in the job market and improve their economic security and self-sufficiency. NAYA Family Center's Foster Care Program provides case management services for Native youth and families in foster or relative care, guardianship, or post adoption. Through the practice of traditional values, the Youth and Elders Council addresses poverty and other community issues by focusing on community solutions to housing, employment, education, health, and racism while building on community strengths. Middle school advocates work closely with youth to assist them in completing their academic programs and/or to return to school by accessing available resources and helping youth to navigate the educational system.